Dr. Hauschka Rose Day Cream nurtures and protects skin. Soft, smooth skin is within reach with Dr. Hauschka Rose Day Cream. Perfect for normal, dry and sensitive skin, this Dr. Hauschka classic helps calm the complexion and reduce the appearance of redness and irritation. Precious extracts of rose petals and wild rose hips help to nurture and balance skin, while shea butter, rose petal wax and avocado oil protect and promote moisture retention. The rich, luxurious cream also features marshmallow extract and St. John’s wort to soothe and fortify. This moisturizer is certified natural, free from synthetic fragrances and dyes, and is dermatologically tested for sensitive skin. Experience calm, comfortable skin with Dr. Hauschka Rose Day Cream. Tell us your thoughts about Dr. Hauschka Rose Day Cream and receive 50 rewards points! I'm almost 50 and looking for a good moisturizer that isn't too heavy (I'm prone to breaking out—still!). This smells amazing and is just the right amount of smooth and greasy. I feel refreshed and like my skin is that of a 30 something year old! I heard so much about this gem of a cream, so I figure I would give it a try, since I needed a night moisturizer. Sadly, my skin did not respond well to it! The next morning I had raised bumps and small white heads pimples on my chin and nose. Not for me! Great emollient for facial skin that becomes dry and irritated from retinol use and extreme dry, cold weather. Yes, it is thick but soaks beautifully into skin. I am 59, and my skin has a tendency to break out with thicker creams but this cream has not caused any breakouts. This face cream is amazing! My skin looks fantastic, it is lightweight and works well under the Dr. Hauschka foundation. I would highly recommend this face cream! I have used the Rose Day Cream Light before, and I loved it. I didn't realize this is quite a bit thicker, but it's working out great since it's winter and my skin tends to get dry this time of year. A friend recommended this product after I complimented her on her beautiful skin. With winter cold and artificial heat my skin is dry! I have to describe this as moisturizing luxury. I love it. My skin looks radiant after applying. We have a new part time home in Jackson Hole now, and it makes Northern California seem humid (it’s not) by comparison. Bought extra for our next visit. A permanent product for me. The scent is mild and lovely too. This day cream softens and moisturizes my mature skin (I'm 72). It has a rose scent and natural ingredients, but the only drawback is that I prefer my day cream to include sunscreen. I still use it with a light sunscreen on top of it. This is gentle, effective and with a scent that is barely apparent. When the temperature is frigid, laying the Rose Cream over a thin layer of the Soothing Mask is super-protective. I can't recommend this product enough. Unbelievable rose smell and feels great on my face. Will order again. I have been using this product Dr. Hauschka's rose cream for many years and will continue to do so. It is an incredible cream for moisturizing especially for mature skin. I am 78 years old and at the risk of bragging no one believes that. Therefore, all the reason to continue this awesome product. Here I am in Colorado, and it is very dry. Dr. Hauschka's Rose Cream has saved me from looking like a prune. Been using Dr H. Rose Cream for 27 years! For goodness sake, I've been using Dr. Hauschka Rose Cream, among other Dr. H. products, for 27 years! I'm 62, my skin looks great, and I don't look my age. What more can I say? 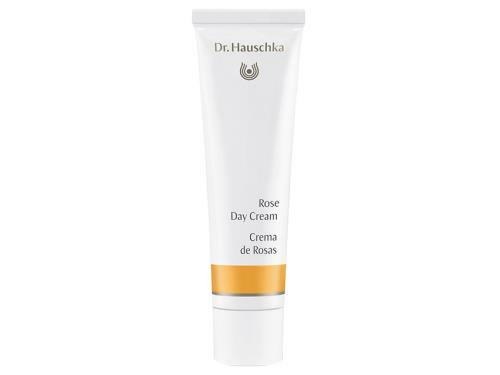 Dr. Hauschka Rose Day Cream is a fine way to begin preparing for the day. After washing one's face, this application is a heavy, non-greasy cream that feels healthy when it contacts the skin surface. Honestly, your skin feels like it is being fed with a product that is enriching. The cream is absorbed within a few minutes and the result is a very healthy look. I've been using Dr. Hauschka products for close to two years, and I absolutely love them. The Rose Day Cream helps during the winter months when the air is so dry. My skin looks and feels better using this. I purchased this cream to use on my dry hands. My hands take a beating and become very rough, extremely dry, at times crack around the joints. I can use this cream to soothe them and help repair the skin when I can not wear heavier creams. It absorbs well. It has a pleasant rose scent. This is my goto moisturizer for the winter months. I normally use the Quince Day Cream, but my skin does tend to get dry during the winter, and I end up needing something with a thicker formula. The Rose Day Cream is the perfect solution, and I definitely notice that my dry skin disappears once I switch back over to it. Dr. Hauschka Rose Day Cream is my all time favorite product. It is a rich, thick moisturizer, and I use it in many ways: as a rich moisturizer when my skin needs extra care, applied generously as a facial mask, mixed with oil or lotion to create a lighter moisturizer, and even as a hand cream. My primary use for it is to mix it with the foundation makeup. This mixture goes on very smoothly like a tinted moisturizer and gives a dewy look to the skin. (A darker shade in the makeup may be necessary if using this way.) I have very sensitive skin, and Dr. Hauschka is never irritating, always soothing and healing. As my title indicates I live in a very dry climate for most of the year. I am sixty-one and have always had nice skin. I have used "high end" products since I was in my thirties. I have found that they don't work well for me anymore. My mom received a sample of this from LovelySkin and told me that she LOVED it. I placed an order that day, and when it arrived I used a bit too much. The next morning I sprayed an organic rose water on my face, used a pea size amount, and patted it onto my face. For the price, it's one of the best moisturizers I have ever used. I'm very happy with the result...no more dry skin! A tube lasts me about three weeks. (I use it at least twice a day.) The reason I gave it four stars is because I don't believe there aren't any anti-aging ingredients in the product, but it is a FABULOUS moisturizer for my skin type.